Sunday and Monday – closed. A’ The Airts contributes to the social, economic and cultural well-being of the communities of Upper Nithsdale by actively encouraging participation in a range of arts, crafts and related activities. 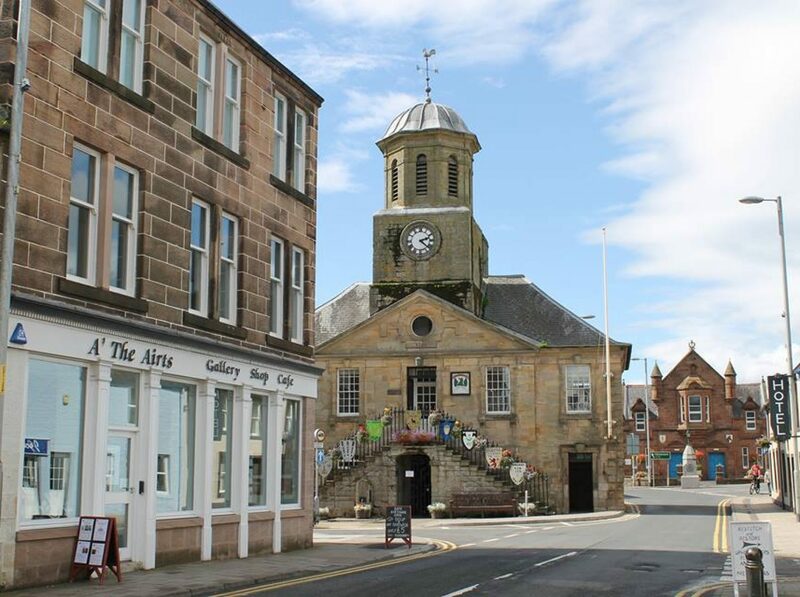 In 2000 some Sanquhar residents had the vision of turning a run-down building in the High Street into an arts, crafts and cultural centre, to help with the regeneration of the area. Local consultation showed considerable support for the idea. After a lot of hard work and considerable commitment, funding was acquired to purchase the site and building work commenced, but stalled in 2008 when some anticipated funding was lost. In the meantime, a group called “Friends of A’ the Airts” was set up to organise cultural activities in Upper Nithsdale. With support from the Big Lottery and the Scottish Government among others, building started again in April 2010, and the centre was finally completed in November 2010. We had a fantastic opening day on 20th November 2010 – with over 500 people through the doors. An official opening followed on 2nd December, when local solicitor Kenneth McLean unveiled a plaque and thanked our many supporters. Since then we have had a varied programme of events including music, drama and poetry. The café and the shop are thriving, we are building partnerships with other local and non-local organisations and there is increasing interest in the centre as a base for a wide variety of arts, crafts and cultural activities. To date, our project has continued to receive support and funding from the Big Lottery Growing Community Assets Fund and Dumfries and Galloway Council, as well as project related funding from the Hugh Fraser Foundation, The Gannochy Trust, The Robertson Trust, the Holywood Trust, Santander and Foundation Scotland. to provide opportunities for people to enjoy arts and crafts and to provide a valued entertainment and learning resource in the area. to promote the work of artists and craftspeople in Upper Nithsdale, showcase their work and to assist them to develop their economic viability. to increase community engagement by working with other groups and schools in the area, supporting young people, the elderly and the disadvantaged. to attract tourists into the area, to work with and benefit all local businesses and help with economic regeneration. Upper Nithsdale has an amazing amount of talent and rich cultural traditions, of which people who live here are very proud and want to share. We are also a venue where artists and performers from outside the area receive a warm Upper Nithsdale reception. Most of all we want our community arts centre to be for the community, with events, classes, workshops and exhibitions for people of all ages and from all sections of the community. We welcome everyone through our doors and also welcome people’s contributions, whether through volunteering or donations or simply telling us what you think and what you would like to see happen.